Woodlands Park is situated close to the village of Biddenden near the town of Ashford in the heart of the beautiful Kent countryside. 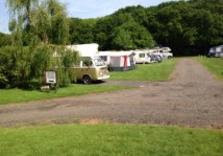 The caravan park offers quiet and tranquil environment to enjoy your holiday. Our central location makes us an ideal base for visiting the many historic Castles, such as Leeds Castle, Hever Castle and the famous Sissinghurst Castle and gardens only 5 minutes away, many other attractions throughout Kent and East Sussex are all within easy reach. At the campsite we operate a small site shop where all essential items can be purchased from camping gaz to a bottle of milk. Our friendly staff are on hand to answer any questions on the area and to provide tourist information on local attractions. Mellington Hall Holiday Home Park offers holiday accommodation situated in Church Stoke near Montgomery in Powys. Peace and tranquillity is the main attraction at Mellington Hall Holiday Home Park, with the Hall and caravan park situated away from traffic, approximately one mile off the main road. We have well trained staff dedicated to making your stay a happy and safe one. There is a massive amount of things to see an do in and around the surrounding area all year round. There are hundreds of footpaths to ramble your way through the beautiful and picturesque countryside. Try your hand at horse riding at Bow house farm just a short drive away. Castlewigg Caravan Park is nestled in the heart of the Marchars Peninsula in the beautiful Scottish county of Dumfries & Galloway. Our camping and caravanning park is a outside of Whitorn and just 18 miles from Newton Stewart making it the perfect place for a well deserved holiday. Our caravan park is an ideal retreat for those who are seeking peace and tranquillity and outdoor activity. Walking, cycling, bird watching and a number of outstanding golf courses to test your skills are just a few of the activities on offer. The gulf stream gives the Isle of Whithorn a pleasantly mild climate and as a result there are many gardens to visit including Galloway House, Castle Kennedy and Logan Botanical boasting a range of tropical plants. Snooker for over 16 years. Our holiday park is a family friendly park that is in an ideal location for a relaxing break away. We are only 6 miles from a swimming pool and a 45 minute drive to the coast. The towns of Harrogate, York, Knaresborough and Ripon are all in close proximity and provide a variety of options for recreation and entertainment. Harlow Carr and Valley Gardens in the very centre of Harrogate, the Jorvik Centre at York and a walk amongst the famous ruins of Fountains Abbey near Ripon are a few worth exploring. The Park of Brandedleys is ideally located to cater for a diverse range of interests. So whether you prefer to spend your time walking amongst stunning scenery, enjoying some fine fishing, taking to the water for some exhilarating sailing, or playing a round of golf, exploring gardens or visiting historic houses and castles, The Park of Brandedleys is the perfect place to be. Safari Cornwall has a pair of shepherd huts that are located in the beautiful countryside of St Kew Parish near Wadebridge in Cornwall. The shepherd’s huts are only a short walk from the local amenities in St Kew Highway and there are miles of lanes and rural footpaths to explore surrounding the site, with the closest beach just a short drive away. Sleeping facilities for 2 adults & 4 children. Kitchen area with fridge/freezer and microwave. Separate washroom & composting toilet. North Cornwall is a beautiful area and has miles upon miles of stunning coastal footpaths and beautiful country walks. During your stay we recommend a visit to Padstow or Port Isaac where you can browse the shops and stop of at 1 of the many wonderful cafes for a cream tea. The nearby beaches of Polzeath, Rock and Daymer have miles of golden sands and offer surf, windsurfing, sailing and safe bathing. Diglea Caravan Park is a friendly family run park in a rural setting outside of Snettisham. The caravan park is situated on the North Norfolk coast, a quarter of a mile from the beach and RSPB Reserve and just five miles from all the holiday attractions of Hunstanton and only ten miles from the historic town of King’s Lynn. Rallies welcome. Our campsite is family friendly and has a club house that provides regular entertainment throughout the season including bands, discos, comedians, family nights, bingo and quiz nights. The Norfolk Coast is an ideal location for a relaxing holiday. However should you feel more energetic the area offers plenty of beautiful walks and cycle routes, alternately why not visit 1 of the many attractions in the area such as Bircham Windmill, Pensthorpe Natural Park, Norfolk Lavendar, Farmer Freds Indoor Play Area. Braggs Lane Farm Camping & Caravan Site is located in a quiet and secluded area which is surrounded by woodlands. The site is in the village of Herne which is 3 miles from the seaside town of Herne Bay in Kent. There are amenities in the village and places to eat, supermarkets and amusements located at Herne Bay. There are 20 tent pitches onsite and 10 caravan pitches which have electric hook up. There are also some spacious pitches which are great for family tents and motor homes. The caravan park has toilet and shower facilities as well as a wet room. There is even a hard stand storage facility. The camping & caravan site is close to lots of local walks and cycle paths. There are lots of places to see in the nearby area from Canterbury Cathedral through to Leeds Castle. It is even just a short trip to the ferry ports Ramsgate, Folkstone, Dover and Channel Tunnel.